Unmarked Spectralids (サンショクシジミ?, lit. : "Tricolored Clams") are insects in Pikmin 2. They resemble small butterflies, colored either red, yellow, or purple. 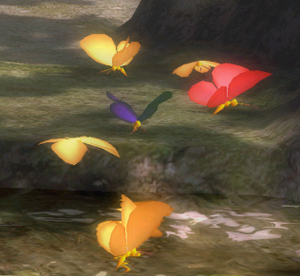 They are one of the harmless enemies in the Pikmin series, having absolutely no means of attack, and do nothing but flutter around. They are located in specific patches of plants and appear upon being disturbed, though in some caves they are readily visible. They will leave the area's boundaries some time after they appear. Their color indicates what they drop when killed, being either a drop of ultra-spicy spray (red), ultra-bitter spray (purple) or nectar (yellow). Underground, they only have a 20% chance of dropping these contents. These creatures are so delicate that, if touched by a single Pikmin, they will instantly collapse and die. Upon being petrified, they will fall down to the ground and crumble; in the Piklopedia, however, they will remain intact. The only area aboveground they appear in is the Awakening Wood, with one group hidden in a Margaret near the Sunseed Berry, and another in a nearby Figwort (next to the bridge there). Red and purple Spectralids do not appear above ground, and can only be found (along with more yellow Spectralids) in rest sublevels of certain caves, usually found in clusters of 20 or more. On the Awakening Wood, only four of them appear together in each spot. Unmarked Spectralids do not appear in Pikmin 3, and have been replaced with Red Spectralids, Yellow Spectralids, and White Spectralids. ↑ The game files specify this value to be 200. Particularly: Add a video of a Bulborb getting shot out by the Spectralids. Unmarked Spectralids seem to not fear creatures that are idling. If there is a Mamuta in the same level as a swarm of Unmarked Spectralids, it is possible to spot some of the Spectralids land on the creature as it idles. In addition, after both the Unmarked Spectralids and the Red, Orange, and Hairy Bulborbs have been added to the in-game Piklopedia, the Spectralids can be seen flying around the former two bulborbs in their respective Piklopedia files. These merely flutter about without waking up the bulborb, occasionally landing on it, but due to the way collisions work in the game, they are unreasonably strong, commonly pushing the bulborb around. With luck, it is possible to open a Piklopedia file for a bulborb, and have some Spectralids spawn inside of it, at which point they'll push it around with tremendous force, with the possibility of shooting it out of the regular map boundaries. Throw the Pikmin at your disposal rapidly into the air in all directions in an attempt to knock them down, or spray a large group with an ultra-bitter spray when you have a small number of Pikmin. They cannot be damaged with punches in any way, not even while petrified or resting atop a Mamuta. The internal name for the Unmarked Spectralids, shijimichou, is a combination of シジミ? (lit. : "freshwater clam"), which is a part of their name, and ちょう? (lit. : "butterfly"). Get an image of a purple one. A close up of a red Unmarked Spectralid. A close up of a yellow Unmarked Spectralid. Official art of Unmarked Spectralids. The creature's e-card, #53 (18th red card). Although their health is specified to be 200 in the game files, they are programmed to die instantly when a Pikmin is thrown at them, making this health value unused. Unmarked Spectralids are the only creatures to appear in another creature's Piklopedia file. If the Spectralid is resting on a Mamuta, and the player sprays the Mamuta, the Spectralid will fly off and flutter about for a bit. Killing the petrified Mamuta and leaving the scene can cause the Spectralid to return to its original position, which means it will stand in mid-air. This page was last edited on November 27, 2018, at 15:49.